Liz first began working with The Right Brain Project when she was cast in their production of Marat/Sade in 2012. 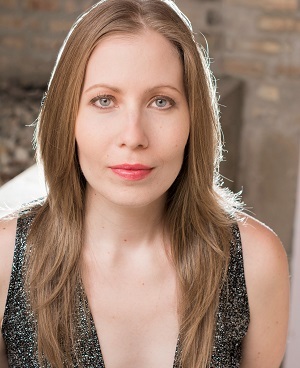 She joined the company as an Artistic Associate in 2013 and is now the company Webmaster. Other favorite shows with The RBP include Raised in Captivity, The Illusion, Salome, and Flowers for Julie. She's also worked with The Ruckus, Roundhouse Productions, and Blank Page Theater. Thanks to the cast and crew for all their beautiful work, and to all my friends and family. Y'all are the best! She is a young woman who is struggling with family tragedy and self acceptance. We all have moments when we feel as though we aren't measuring up to our or other people's expectations. For her it feels like an obstacle she will never overcome. I have a lot of empathy for her. There's a moment where Maeve and her mother have an opportunity to really talk about their tragedy and start to heal together, but for both of them the path toward healing seems almost impossible. It reminds me of how often we choose not to talk about things that are difficult because we feel that it will be easier or better for ourselves or the other person somehow. In the end, staying silent often hurts the person we are trying to protect.